New cycling jersey pictures coming soon! Woke up super excited about my Lovely Creations cycling jerseys photo shoot today! I’ve been wanting to add pictures to the website of someone modeling my cycling jersey designs, but I’ve never made the time and didn’t know where to start. Lucky for me, I have many amazing photographer friends, but most don’t have a venue with all the equipment necessary for the photo project I had in mind. After sharing my project idea with Eric Jimenez, he immediately replied, “Let’s do it!” I was super excited and we scheduled the photoshoot. Now the problem was finding someone to model the jerseys under a tight schedule, but a friend suggested that I model them myself. Problem solved! It was fun to watch Eric crop and adjust the white background on all the pictures. He even performed digital plastic surgery on a big scar I have on the back of my right arm. I would have loved untouched pictures, but unfortunately the scar was too distracting. Other than those image adjustments, the rest of the image was left untouched. Ramon posing with the Linux Tux cycling jersey. Photo by Eric Jimenez Photography. 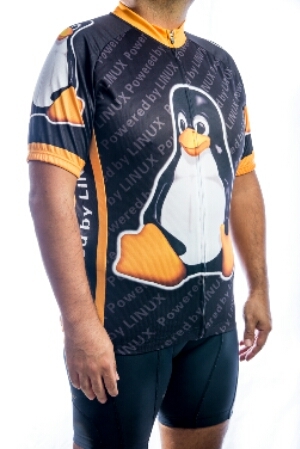 I even asked my husband, Ramon, to model the Linux Tux jersey I designed for him and a couple of other jerseys too. It was a fabulous photo session. Who knew that amateur modeling would be so much fun! Now I just need to resize and upload all the pictures for each product on the website. Follow Lovely Creations for the latest shop news and offers!